Nice skin. I would like to have this in a more tan/yellow-ish, but you have a really good idea going on. most of the rice paper I have is white/whiteish, but I have seen it on yellowy paper (due to age) and I have some good papyrus laying around here somewhere. I used to mail order exotic papers before I got into digital art. If I did something like that I'd want at least a small amount of the texture, maybe just behind the 2draw part, and not just a plain color. real nice. the W is a tad bit weak, but I'd definitely use it. I like that! I would use it too! The 2 looks like a swan...I think the color is very pleasant and soothing. It's really easy on the eyes, I like it. the applet was acting up while I worked on the r a bit. I added a slight ting of color to the welcome bar to see what it'd be like, and a bit of gradient on the top right. I probably overdid it with the layers. I've merged a couple of them, but I was up to 9 for different opacities. 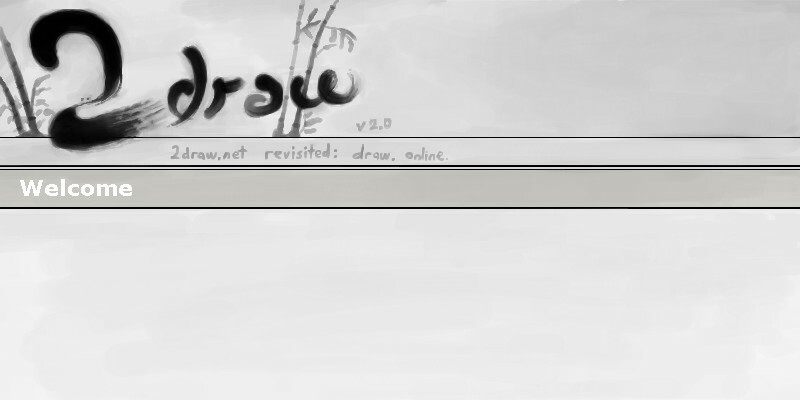 cleaned up/straightened some lines, the rough spots on the bamboo, and shrank the 2draw.net revisited bar. I thought about recreating the front page boxes and stuff in the bottom half, but I didn't see much point in it. I guess I could do a second theme on the bottom half, maybe later. This is awesome. I would also use it. This one is very nice! I like the inky and grey style. It would be fun to see it on the front page. I still like this one very muchly-I wonder if it will ever be a skin. The more I see this, the more attractive I see it but alas! I personally, think it would look alot better if the middle line of the 2 was a bit more solid than just a thin line like it is. Maybe also if you were to get rid of the bamboo on the right, gets in the way of the logo kinda, and i agree with the comment above. More tan maybe or hell even the same blue as now. Just a little more color me thinks it. By the by; Even if this stayed the same I'd still love to see it on the front page!